Even women can be cool and smooth criminals if they want to be. And in “Ocean’s Eight” they are. In this latest franchise “reboot,” though it’s more of a spin-off, we learn that steely cool con-man Danny Ocean is dead and that con-men run in the family. His sister Debbie (Sandra Bullock) is just being released from a five year prison sentence and has her sights on a prize: The Met Gala. She gets her equally cool gal pal Lou (Cate Blanchett in the “secondhand man” role carved out by Brad Pitt except she isn’t eating something in literally every scene) and a team of women together to rob the expensive jewels off the neck of famous actress Daphne Kluger (Anne Hathaway, doing her best diva impression). 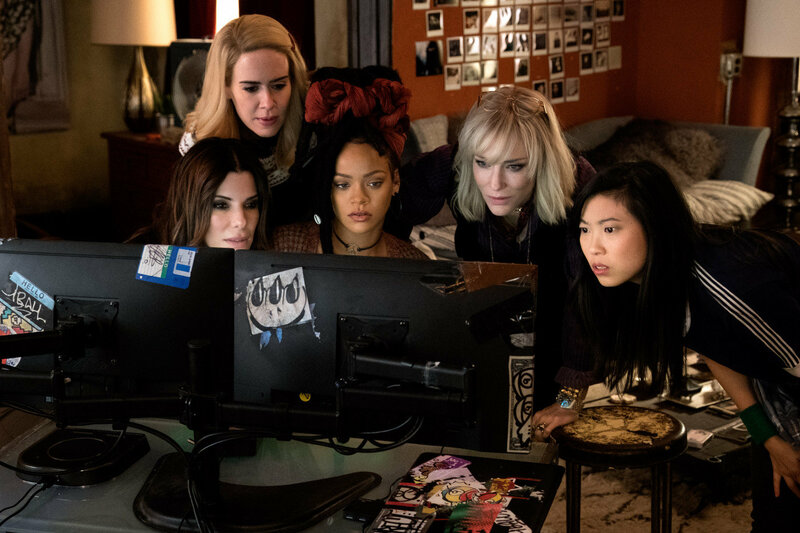 The entire film is basically following these women as they concoct a completely crazy and unbelievable set of circumstances that will lead to them walking away with millions of dollars worth of priceless jewels. And it is fascinating to watch. The Ocean’s films have always been about fun. At least the first one was. Watching these guys pull of such crazy cons and a seemingly impossible heist was part of the charm. Steven Soderbergh’s sequels, however, took all the fun out and made things overly complicated and overstuffed with extra characters no on cared about. A reserved cast of eight con women is much more digestible. This time Gary Ross takes the reigns from Soderbergh (who’s still a producer) and injects a tad more diversity to the proceedings. Ross and co-writer Olivia Milch’s script is tight and exciting. The story is so fun to watch unfold that for the entire film I forgot that there really wasn’t much conflict. In the original film, Danny wants to rob a specific guy, here these ladies just want the money; or at least that what it seems. There is a whole subplot about the reason Debbie was sent to prison after all. Of course, that doesn’t mean there isn’t moments of suspense and tension. One sequence in which Mindy Kaling’s character is close to being caught is squirm-worthy. Speaking of which, every character gets their moment to shine. Helena Bonham Carter easily slips into the roll of a crazy, overwhelmed fashion designer. Sarah Paulson is a suburban mom but hasn’t quite left a life of crime. 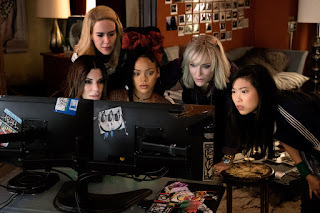 Rihanna is the genius computer hacker and Awkwafina is the fantastic pickpocket. And some other familiar faces show up as well.